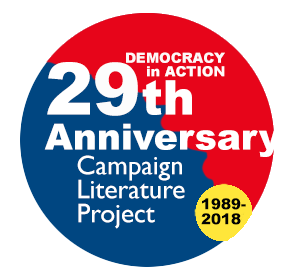 The Campaign Literature Project and Archive provides a unique view of recent American political history through basic campaign literature from general election campaigns for Governor and U.S. Senate across election cycles. The project celebrates American democracy showing the range of candidates, viewpoints and issues over a period of almost 30 years. Since 1989 I have collected these materials from Democratic, Republican and third party nominees and independent candidates for the top of the ticket races in each state in the general election. This is not a partisan endeavor; I'm interested in literature from the candidates irrespective of party. This project focuses on general introductory lit. pieces—brochures, leaflets, pamphlets, palm cards, plans, comparison pieces and even recipe cards. These can be thought of as the "introductory handshake" of campaign literature. They are typically found in campaign headquarters, distributed during canvasses and handed out to voters at rallies and events. 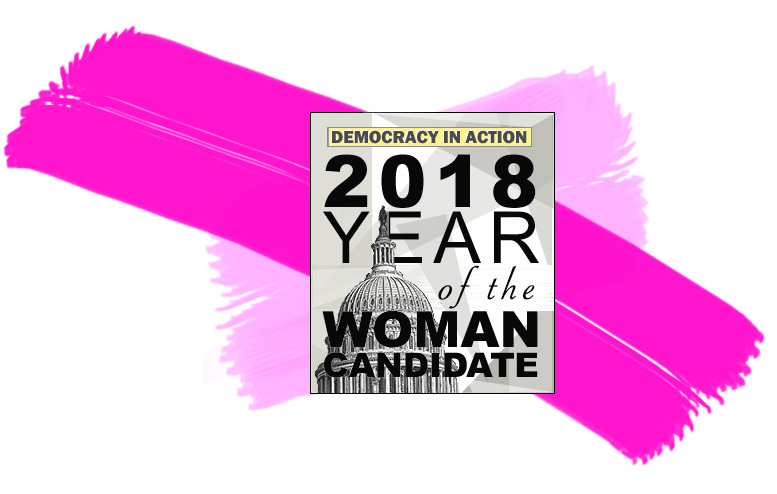 There are other kinds of campaign literature, ranging from detailed position papers to slick persuasion mailers often used for attacks, that are not considered here. You can see pages for the 2016 and 2017 races and 2018 in progress from the links at top left. These give a sense of what I'm aiming for. I'd welcome any suggestions or comments you may have on the format and utility of these pages. Also, if you like the idea of this project and have suggestions on resources to support and advance such work, please contact me. [To scan all the material would entail a tremendous amount of work, as will getting the results and notes done. Ideally I would like to include shaded interactive maps that show the results by county when they are scrolled over, and I would like show trends (>); this would require technical assistance. (The 2017 pages have static maps as an example)]. Since I started the project, much has changed in campaign communications; most obviously web sites now provide an easy way for citizens to find out about campaigns and social media have assumed increasingly importance. The ascendence of the web has led to small and large changes in campaign literature. Tri-fold brochures have given way more and more to palm cards. Graphic design has advanced, bringing a broad range of fonts and font treatments and more abundant and varied use of photographs. Depending on the resources and priorities of a campaign, its literature may be beautifully designed and printed on heavy paper stock or more hurriedly thrown together and run off on regular photocopy paper. What matters to the campaign is how effective a piece is. Ultimately I would like to conduct a content analysis of these materials to understand how campaign literature is evolving over time and what the differences are from cycle to cycle. Broadly, content in a brochure or palm card covers two major dimensions: a candidate's experience and qualifications and his or her positions; the proportion devoted to each varies according to the candidate. Many of these pieces have very little substance–sometimes just a few bullet points that it would be hard for any voter to disagree with. The aim may be to pique interest and point people to the campaign website. Nonetheless, the limited space afforded by a piece of paper as opposed to Internet forces a campaign to prioritize and highlight some points. One expects analysis of the text will reveal differences among several dimensions. The major themes and issues emphasized from election cycle to election cycle are likely to be different. For example, immediately following 9/11, national security was a major concern; in recent cycles jobs and the economy have been key themes. Republican and Democratic materials will show differences in the issues addressed and language used. Literature from governor and Senate races will highlight different sets of issues. Depending on the state, party and ideological labels ("conservative" or "independent") may be important. Other words such as "values," "principles," "leader," "courage" and "fighter" may appear frequently. The photographs, images and graphics used provide another area for analysis. Photos can include formal family shots or head shots, archival shots of the candidate in younger days, shots of the candidates interacting with voters, stock images such as mountains or energy facilities used as wallpaper, and sometimes composite images. The content analysis may also consider whether the images include symbols such as flags or guns or pets or military imagery. Logos offer another area of possible analysis. Some logos include the state outline or state symbols; red, white and blue are obvious colors, but there are regional differences (for example green in Vermont and warm colors in New Mexico) and recently there seems to be use of green and blue combinations. Even in this Internet era, the pieces of campaign literature handed out to voters during canvasses and at events still serve an important purpose, and they are the focus of this project. to or can obtain lit. Copyright © 2017, 2018 Eric M. Appleman/Democracy in Action. All rights reserved.